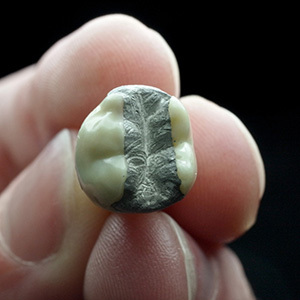 Dental amalgam is a filling material that has been used by dentists for over 150 años. A mixture of metals that typically includes silver, copper and tin, dental amalgam fillings (commonly referred to as “silver fillings”) also contain mercury, which has raised safety concerns among patients from time to time. While compuesto (o “tooth colored”) rellenos are more durable than ever thanks to advancements in technology, there are still many cases where amalgam fillings perform better (and longer). This is often the case with teeth that are naturally subjected to extensive chewing force, such as molars. Mercury is an important part of the amalgam mixture as it contains unique elements that allow it to be manipulated with ease during placement and then harden quickly after. In addition to the benefits of longevity, amalgam fillings are also more affordable than composites. Composite fillings are typically made of a resin and glass mixture. They are tinted to the color of your teeth and are commonly referred to as “white” o “tooth-colored” rellenos. They serve an important purpose for teeth that are visible when smiling, providing an aesthetic benefit not afforded by silver fillings. While resin composite fillings undoubtedly look better than amalgam ones, they are generally considered to be less durable, and they may not be ideal for teeth that are subject to extreme chewing and biting forces. It is worth noting, sin embargo, that composite materials continue to benefit from technological advancements, contributing to enhanced durability. The ADA supports composite materials in small or mid-size fillings on teeth that are exposed to moderate pressure from chewing, and acknowledges that they are a good choice for a more natural-looking filling.